Joy’s mother was having a tough time due to illness. Her daughter wanted to do something for her birthday that would cheer her up. 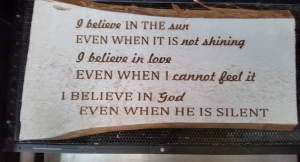 The solution was to engrave one of her mother’s favorite motivational sayings on a rough piece of wood.